Found this graffiti in Fitzroy Pl on a decrepit fence. The painter ran out of paint halfway into doing this. Even worse is that their backup colour was motherfucking orange. 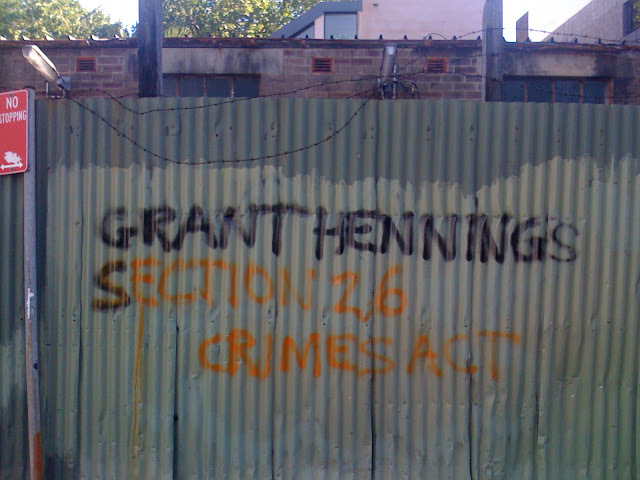 But who is Grant Hennings? And what is section 26 of the Crimes Act? Well, it's a section entitled Conspiracy to Commit Murder and basically states that the punishment for this crime is 25 years imprisonment. What did Mr Hennings do?